MOUNT PEARL, NL – A new brewery from a pair of Newfoundland-born brewers who moved back to the province last year after several years away will be opening on Thursday December 6th in the city of Mount Pearl. Landwash Brewery is being established by Christina Coady and Chris Conway, previously the founding brewers at Folly Brewpub in Toronto, along with third partner Jennifer Defreyne. Located at 181 Commonwealth Ave. in Mount Pearl, Landwash features a 15-barrel brewing system, taproom, and retail store selling cans and growlers. Beers available at launch will include That Much Ocean New England IPA, One Wave Blonde Ale, Hazures’ Rock Breakfast Stout made with Tanzanian beans from Jumping Bean Coffee, and Brackish Sour Ale, a take on a Gose brewed with Newfoundland Sea Salt. Joining them later in the month will be Home and Away American Pale Ale and the Kölsch-style Smiling Land Lagered Ale. 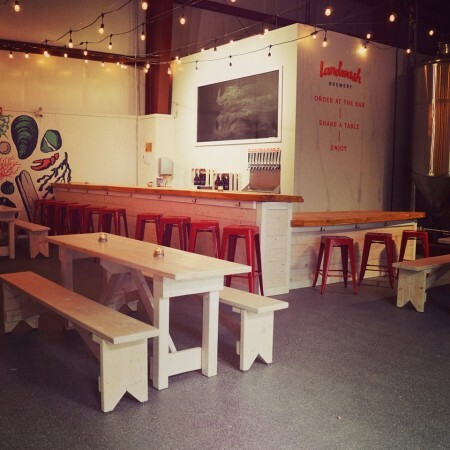 Landwash Brewery will be in soft launch mode for the month of December, and will be open from 4:00 to 10:00 PM on Thursday and Friday, 12:00 noon to 10:00 PM on Saturday, and 12:00 noon to 6:00 PM on Sunday. Regular business hours will start in January. For more details, see the Landwash Brewery website and Facebook page.